The central Colombian municipality of Puerto Gaitán is home to the nation’s largest crude oilfield. One of the largest producers operating in the field is Pacific Rubiales Energy Corp., a Canadian-based producer of natural gas and heavy crude oil. Pacific Rubiales has been operating the oilfield since 2003 in association with Ecopetrol SA, the Columbian national oil company. 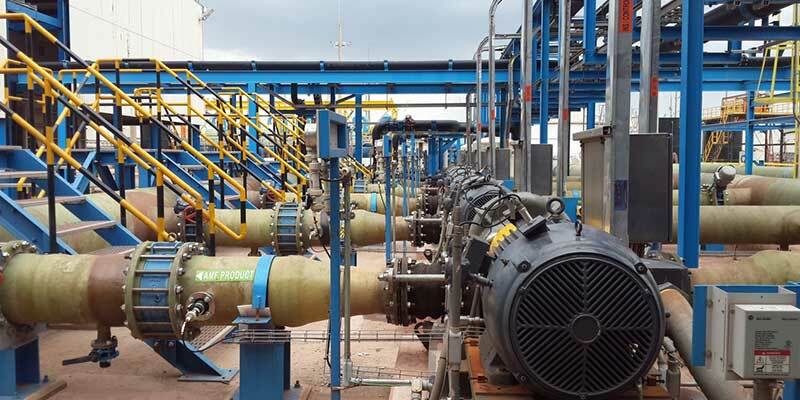 Before launching this water-recycling project, Pacific Rubiales separated produced water from crude oil, then disposed of it via deep aquifer injection. High disposal costs and environmental constraints necessitated a new solution for water treatment. In the Rubiales oilfield, natural groundwater is trapped and mixed with crude oil, and the mixture is jointly extracted. While the global average ratio of water to oil is 3:1 in produced water, at the Rubiales oilfield it reaches 9:1, which means a very large quantity of produced water requires treatment. To effectively treat the brackish water remaining from the drilling process and to maximize water reuse while eliminating brine disposal, Fluence designed, built, and commissioned a multistage treatment process. Crude oil production is expected to grow in the coming years, increasing the amount of produced water to be treated. Pacific Rubiales uses the recycled water for irrigation, which necessitates the maximum recovery rate possible. The feed water is brackish and also typically contains residual oils, hydrocarbons, solids, and other contaminants, all of which must be thoroughly removed before reverse osmosis desalination can take place. The remote location and tropical climate make the project logistics uniquely challenging. All traces of oil are removed with membrane technology before the produced water is desalinated. In order to meet irrigation standards, the treated water must have a total salinity of less than 240 mg/L, with less than 0.5 mg/L of hydrocarbons and a sodium adsorption ratio of less than 10. The plant is designed to allow 90% of the feed water to be used for irrigation, while 10%, which includes RO brine, is disposed of via deep well reinjection. Other waste streams from the plant can be treated to solid sludge for landfill disposal. The wastewater treatment plant is sized to accommodate approximately 4,000 m3/h, or 500,000 barrels/d of treated produced water. In addition to the engineering, procurement, and construction (EPC), Fluence will fully operate the plant for 10 years. This is an exciting win-win project for Pacific Rubiales, providing an innovative, lower cost and sustainable alternative to manage water production from our Rubiales oilfield, as well as establishing a new green industry that benefits the region. We need a partner with leading edge technology and global experiences. We couldn’t be happier with the selection of [Fluence], and are looking forward to a strong working relationship. Multistage, fully automated wastewater treatment and desalination plant, including screen filtration, advanced microfiber filtration, micron cartridge filtration, reverse osmosis, sludge treatment including dissolved air flotation, and chemical balance with calcium hydroxide.